If one has not read her first book, Fuego, the initial pull towards Leslie Contreras Schwartz´s Nightbloom & Cenote could accurately be inspired by a swift judgement of its striking and taxonomical cover: “Ascidian” by Earnst Haekel from Kunstformen der Natur, showing colorful illustrations of marine invertebrate filter feeders, in combination with its enigmatic title. The image invokes night blooming jasmine, whose intoxicating scent is present in many poems, smell being the most powerful trigger for memory, as well as cenotes, which Schwartz gives the dictionary definition for at the beginning of the collection: a natural underground reservoir of water. The cover´s shapes recall eggs, ovaries, coral, cells, and a host of other links that might partially prepare a reader for what they are about to experience in these pages. Though the poems are even more varied, denser, more layered, than this vibrant image implies, the sketch helps to begin a collection which unpacks what is passed down and passed on, all with the wild backdrop of Houston to act as stage. As Haekel did with his aquatic subjects, using both symmetry and taxonomy, so does Schwartz with the facets of Houston which only a native could accurately dissect and reproduce for study. Here we see the power of scientific observation and its brilliant translation into the service of poetry. 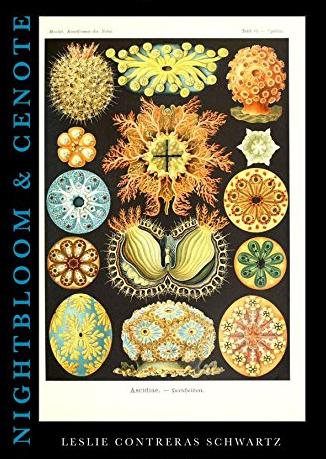 At first pass, Nightbloom & Cenote reads more like a collected works than a self-contained second book of poems. hid myself without knowing I did. my body the leather belt / from which she is hiding. its endless deep cavernous sound, that led her here? Describing a futile stay against a darkness which is already comfortable inside, this obsessive repetition is not fearful, rather it becomes a powerful chant the speaker uses to psych herself up for an eventual escape. for this son, he knew his son could be taken away at whim. Focussing on Schwartz’s end words often draws out an attention to sound which more often leans on alliteration and assonance rather than rhyme: create when wishing whim Amen of all blurry back beginning. Athletic logic flows through connections which feel at once universal and tied to the multiethnic hydra that is Houston. Here Schwartz finds a strange sympathy for the aggressor, for the abusive God, the reckless creator, the O Great Terrible One charging violently through the delicate world it crafted to be so breakable. Beyond all hope of redemption, this creator is urged to “turn that hand on yourself” as this speaker has “stopped looking for you in the pews/of synagogues, churches, fields of grass, cliffs.” There is no longer any use for a petulant deity as the speaker realizes definitively that true divinity is found in these human beings and their ability to sing out and sing through the injustices heaped upon them. Here, with eyes and recognize, we have more overt internal rhyme (also present in her first poem which speaks of “A secret, / hidden from the nuns with their tight and coiled buns.”) which is a rare occurrence in the collection. landscape is bald / and yet my body remembers. where I need to make two transfers to get to my destination. Because of all that has come before this moment, transfers takes on its full transcendental meaning when placed within the context of having a physical body and destination expands ominously. Diving deep and deeper still into darkness is the remedy to trauma within these lines, fight fire with fire, close one´s eyes and use every inch of the other senses when the lights go out. Revisiting the cover, its colorful filter feeders recall our worn Gulf of Mexico with all its potential ability to regenerate and cleanse itself if left with enough time to heal. Wading into these poems, so too are women left to cleanse and sift the world, but they need time and space to do so. Room to breathe and stretch out; Schwartz does this deep breathing and expanding best in darkness, with the aid of her nocturnal jasmine and down within the deepest wells. This collection forges a healthy faith in darkness by pulling us into this natural well from which we won’t want to return. 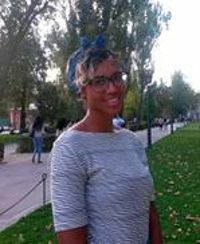 Layla Benitez-James is an artist and translator living in Alicante, Spain and serves as the Director of Literary Outreach for the Unamuno Author Series in Madrid. Her poems and translations have appeared in The Acentos Review, Anomaly, Guernica, Waxwing, Revista Kokoro, La Galla Ciencia, and elsewhere. Her audio essays about translation can be found at Asymptote Journal Podcast. Her first chapbook, God Suspected My Heart Was a Geode But He Had to Make Sure was selected by Major Jackson for the 2017 Toi Derricotte & Cornelius Eady Chapbook Prize and published by Jai-Alai Books in Miami, April 2018.